Fahrenthold reached out to dozens of charities, and took to Twitter, asking his followers for leads. Despite his exhaustive efforts, he hasn't been able to come close to accounting for the $8.5 million Trump publicly pledged over a 15-year period. The lack of evidence to support Trump’s claims has raised questions about Trump’s honesty – and just how charitable the self-described billionaire has actually been. What clues led you to doubt that Trump had actually donated to his son's charity? If there had been a large sum of donations from a family member of a director of the Eric Trump Foundation, like Donald Trump, that would have shown up in a specific spot in the tax form 990 for the Eric Trump Foundation. And it wasn't there. These experts that I was talking to said, you can read that and see a process of elimination that there haven't been huge donations from any family member of Eric Trump. That's what got me back to him and I asked him again, "Are you sure about this?" You've obviously gone public with your reporting, sort of crowdsourced the process in some ways. What have been some of the more interesting leads that have come in? A Tim Tebow helmet where a reader had spotted this picture of Trump at a charity auction with an autographed Tim Tebow, Denver Broncos helmet that he'd bought and that led us to this great story about how Trump had used charity money to buy this helmet for himself. That would have been problematic only if he'd kept the helmet? Or what was the issue there? That's the funny thing. The IRS says that if you're the leader of a foundation, obviously, you can't use your foundation's money to buy things for yourself. Trump bought this helmet for $12,000…The question is what became of it? If Trump has kept it and put it on display in his office or somewhere else that's self-dealing. The IRS says you're not allowed to do that. If he had an office for the Trump Foundation, he could put it there, but there is no Trump Foundation office. It doesn't have any staff or any buildings or anything. In order to comply with the law, he has to use the helmet for charitable purposes. He has to give it to a charity. The question is what became of it. We've got no answers from Trump about it. Eric Trump said he thought his father had just given it to a random child which is also not allowed by the IRS. Tell us about the cameo made by Muammar Gaddafi. That was one of the more interesting tidbits to arise out of all this. I think it was 2009, Gaddafi comes to the United Nations in New York to give a speech and he was looking for a place to stay. Gaddafi did not like to stay in buildings. He liked to stay in a Bedouin tent outdoors, a large Bedouin tent. He had rented, from Trump, space at this estate in Westchester County, New York. I think he paid like $150,000. At the time no one mentioned this but then two years later Gaddafi has been deposed and was killed in Libya, Trump was asked about this: “Didn't you rent some properties to Muammar Gaddafi for his tent?” He said, "Oh, yeah, yeah, I gave that all to charity." That's a pattern. 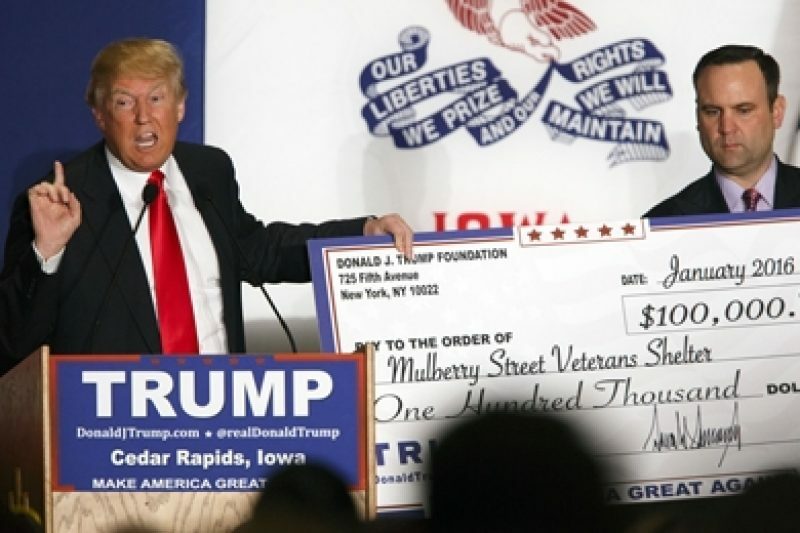 Trump said at one point that he was going to give all the money from Celebrity Apprentice to charity. He said he was going to give the money from Crippled America, his last book, to charity... I haven't been able to find any evidence that he actually gave it to anybody. Listen to this podcast on iTunes, SoundCloud or Stitcher. For more, read Fahrenthold’s stories for The Post.